In transit at Moscow Sheremetyevo Airport, and was impressed with some of the improvements they have made to the airside facilities since my last visit. Did not have to use immigration, and headed instead to Terminal E where the flight was departing from. Hainan Airlines customers (and most other airlines here) use a Handling Lounge facility. The lounge was quite large and provided a good selection of seating types, work stations etc – all okay for a shortish 1 hour wait, but it’s not a lounge where you would want to spend much longer. Food choices were very limited, mostly packet snack items, some fruits but no in-lounge dining options. WiFi connection was poor and many other customers were complaining about this. Airbus A330-300 in Business class, which was about 80% full on this flight. Hainan Airlines Business Class permits 2 x 32kg checked luggage and 2 x 10kg carry-on baggage items. Hainan Airlines use the Sogerma Solstys full flat business class seat on these A330-300 aircraft, arranged in a 1x2x1 layout. Seated at 2C which is a single, window seat that provides great privacy. Seat comfort is good, a good seat/bed length and easy access to table, storage, IFE etc – the only downside is that the seat width can feel a little bit tight when in the bed position, especially when you have the seatbelt with airbag fastened over you (these are bulky). The business class cabin has 3 toilets, one smaller one at the front and 2 by the middle galley that are larger. Presentation of the toilets was immaculate throughout the flight, and as you move towards the toilet a member of staff will rush in and check cleanliness before a customer uses it. A good selection of Bulgari amenities are provided in the washroom, plus cotton hand towels. The flight departed almost bang on time, and arrival into Beijing was 20 minutes ahead of scheduled time. Boarding drinks are served in business class, offering a choice of juices, water and champagne, and staff are most efficient and quick to provide this. A bowl of mixed nuts is also served with the boarding drink, and everything is nicely presented with coasters always used for glasses. Cabin staff distribute the menu and wine list to customers, and take the orders after departure – and it was pleasing to see that they knew all about the wines they had in the wine list choice! 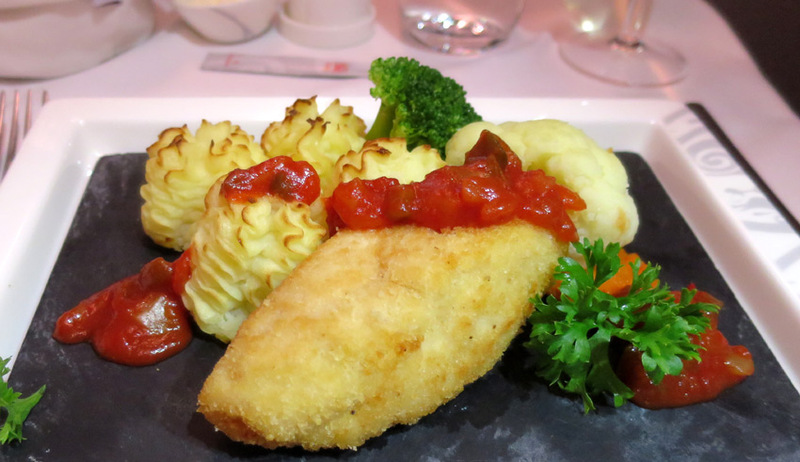 Hainan Airlines offer a choice between Chinese and Western / International cuisine for all meal types. This evening departure offered dinner and a breakfast service, and I opted to select just 3 items off the western menu. The full service offers an appetiser, salad, soup, entrée, dessert, cheese trolley and fruit service. 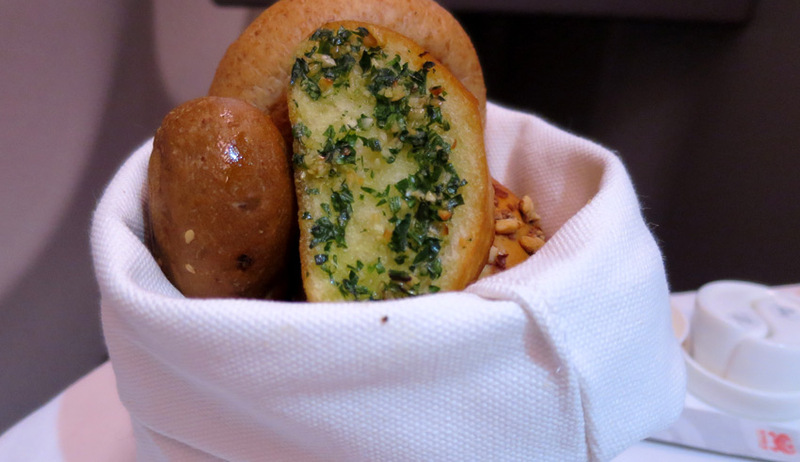 Breads are offered as a selection of 5 different types and beautifully presented in a classic linen breadbasket for each customer. 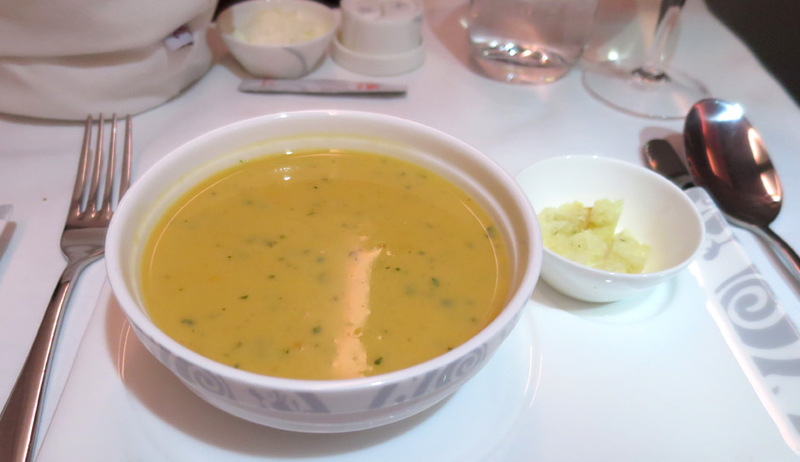 The soup was served perfectly heated with good flavour, and a tender veal entrée dish that followed was more than enough for my appetite. Breakfast service provided a choice of juices, pastries and croissants, cereals, yogurts, fresh fruit and a hot omelette entrée. Coffee and tea selections are extensive, and I was able to enjoy some good quality Illy espresso before arrival. 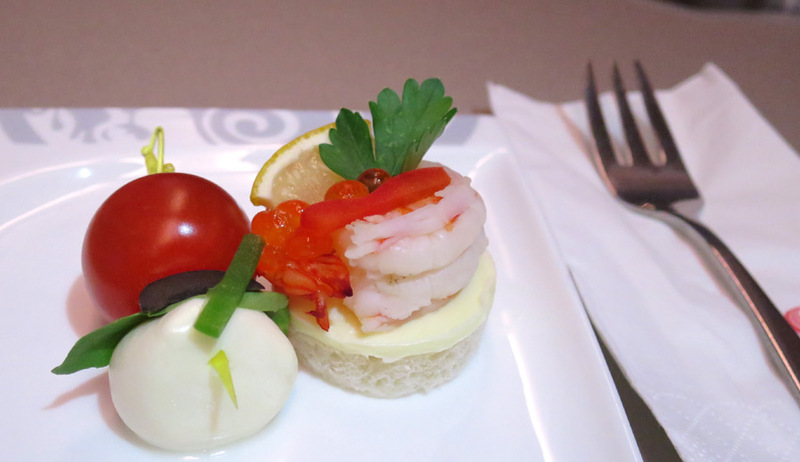 The china tableware that Hainan Airlines provided for the meal services has some very nice, unique design and shape features that show attention to detail. The IFE screen is of a good size and well placed for viewing when seated or lying down. 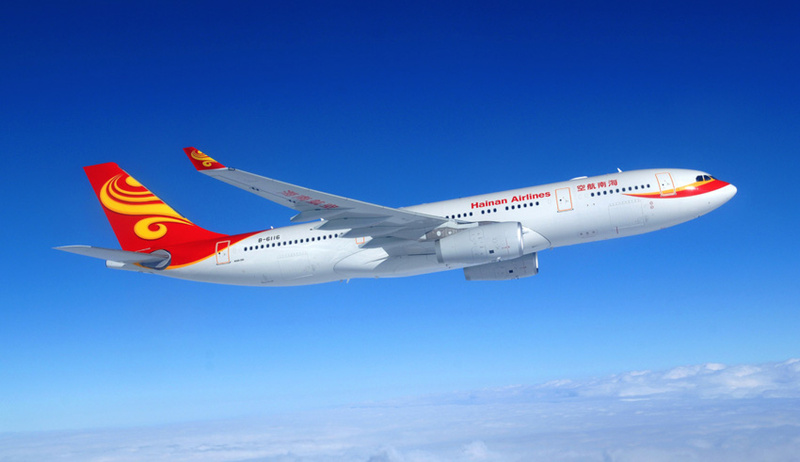 There was a good selection of Hollywood and Chinese movies and some fairly recent releases available, much more than many expect on a Chinese airline. They also offered a good range of TV series / programmes, and noise cancelling headsets worked well. This is an area where Hainan Airlines stood out, with an abundant offering of hot and cold towels, nice large and soft pillows and an excellent duvet. Staff come and make up your bed when you’re ready to sleep and lay a sheet as well. Pyjamas are provided to business class customers (which were for once quite nice! ), and a nice Bulgari amenity kit is also supplied. It is best summed up as fabulous. From boarding the plane to leaving in Beijing the cabin staff were attentive, courteous and friendly, and appeared very happy in providing the service to customers. Skills were as good as some other top Asian airlines, and many western customers probably wouldn’t expect to see such high service standards on a Chinese airline. The service efficiency was impeccable, they were ever present to attend to needs, and were also eager to talk to foreign customers in a bid to show off and improve their English language skills I guess! No communication difficulties at all, and their uniforms were also very smart and elegant. Arrival into Terminal 2 Beijing Capital Airport was fortunately ahead of any other international flights, and Immigration did not require any wait. No checked luggage, and in just 10 minutes I was in a car to my hotel. A flight that is memorable for the right reasons – being comfortable, enjoying great food and cabin staff care and attention that wanted for nothing more. It’s not a long overnight sector, but I felt reasonably well rested on arrival. Most certainly would use Hainan Airlines again in the future.